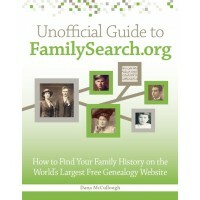 Although my new book, Unofficial Guide to FamilySearch.org, covers the records and resources available on only one genealogy website, there are certainly other genealogy websites that have tons of free historical records, too. Here are the sites I consider the best of the best for free genealogical records (in alphabetical order). This is an excellent site dedicated to African-American genealogy. It includes great information for beginners as well as databases for death records, library records, marriage records, and surnames. Search millions of geo-tagged headstone photos and transcriptions. You can contribute, too, by taking photos with your smartphone when you visit cemeteries. If your ancestors arrived in the 1800s before Ellis Island was opened, search this website. Castle Garden welcomes 11 million immigrants from 1820 to 1892. Search the site’s database by passenger first and/or last name, port of departure, ship name, country or place of last residence and date range. Search for ancestors who arrived in New York from 1892 to 1957 in this database of more than 51 million passenger records. Especially if you’re researching Jewish roots, you’ll want to tap into this site’s databases of Holocaust records, Yizkor books, given names, and more. Searching individual databases on this site it free. You can find a wide range of records including school yearbooks, church and local histories, newspapers, military records, court records, immigration and naturalization records, city and professional directories, and parish registers. Volunteers run USGenWeb sites for each U.S. state. Depending on the state, you may find transcriptions of census records, vital records, obituaries, military records, and other genealogy records. Look for land patents and deeds for your ancestors who became landowners in public land states. This is the global counterpart to USGenWeb. You can find volunteer-transcribed genealogy records for the Caribbean, Asia, Africa, Central Europe, Eastern Europe, the United Kingdom and Ireland, the Mediterranean, Oceania, and South America.